The brake metering valve, similar to the proportioning valve, is used to achieve balanced braking. These valves are often integrated together, along with the brake warning switch inside of the combination valve. It's used by front disc, rear drum brake systems. It delays the front calipers just long enough to overcome the rear brake springs and linkage. This achieves even brake application of the front and rear brakes. Most FWD diagonal based brake systems used in passenger cars do not use a metering valve. Most of the braking power comes from the front brakes (70% to 80%). It is not used on four wheel disc brake systems. For this reason expect to see this valve in front disc, rear drum brake systems. It's located in-line to the front brakes and holds back pressure to the front calipers until enough pressure builds in the system. Rear brake apply pressure builds to a point, (75-125 psi) that forces the valve open allowing pressurized brake fluid to flow to the calipers and then applying the front brakes. The metering valve has an inlet port from the master cylinder and a port for each of the front calipers. A spring maintains pressure on a sealed port blocking fluid pressure to the front brakes. 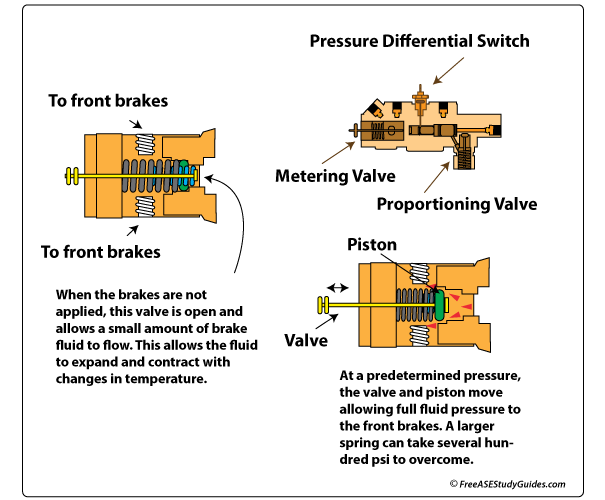 As pressure builds in the system the spring pressure is overcome and the valve stem moves until it reaches a hold-off point. It is at this hold-off point that the brake fluid is allowed to flow freely. The valve can become stuck open resulting in a nose dive condition. If the valve sticks, the vehicle will suffer from a lack of stopping power. This is because the front brakes are not receiving full pressure. The metering valve works with a proportioning valve to achieve balanced braking in front disc, rear drum brake systems. A proportioning valve is located in-line to the rear brake system. It's used to prevent rear wheel lock-up during sudden and hard braking situations. A height sensing proportioning valve is located between the rear axle and the vehicle's frame. They reduce pressure to the rear brakes as the rear end lifts during hard and panicked braking. As the distance between the axle and the frame increases, the proportioning valve reduces hydraulic pressure, preventing rear tire lockup.